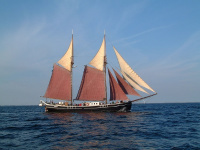 Sailing ship Helena was built as a Schooner in 1916 at the Ystad Shipyard, in Southern Sweden, by Master shipbuilder Johan Henrik Grufstedt. After a short stay in Göteborg she was bought by the Swedish Cement Sales Company in Malmö in 1917. The company out fitted the ship with a 20 hp Avance motor. In 1922 T/S Helene was sold to Stockevik, from 1926 for the next 4 years she sailed the West Coast route and Stora Kornö . In 1930 she was sold to the Smålands Coast, this would be her new home for many years to come. During this time both human and natural events would change and improve her 1938 a 60 hp 1 cylinder Munktell motor was installed. After a rigging collapse in a heavy storm in 1943, she was re-rigged to a galliot. Up until the mid 1960’s she was employed as a cargo carrier, at which point she was put up for sale. In 1967 she was brought by Anders Lönn from Kalmar and re-registered as a pleasure vessel. She was used occasionally as a sail training ship, but the majority of time she was used as a theater ship by the Kalmar town theatre. For 29 years Anders Lönn carried out renovation work on her. One of his renovations projects was to replace her rigging. He also replaced her engine with a new 1981 Volvo Penta TMD 100 with 195 hp. In 1996 T/S Helene was again on her way to the west coast, this time too Grebbestad, then in 2000 she was bought by Ystad’s Sailing Club and with this she returned to home of construction, Ystad. T/S Helene is now registered as a training vessel/ passenger ship for 30 students /passengers and 5 regular crew.